It looks the same as last year, but its not exactly the same. 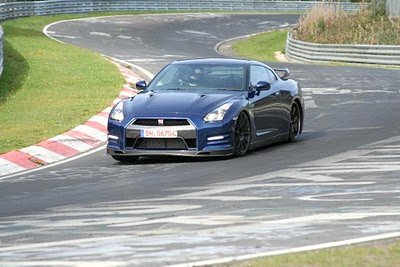 Even though the 2012 Nissan GT-R had some major changes, just one year later, we get a few more. The biggest change is a bump in horsepower from 530 hp in 2012 to 545 hp in 2013. GT-R is built on an exclusive Premium Midship platform, which enables the use of the world’s first independent rear transaxle ATTESA E-TS all-wheel drive system. This system places the transmission, transfer case and final drive at the rear of the vehicle, optimizing weight distribution and maximizing handling capability. Total vehicle adjustability is provided by three set-up switches located in the center of the instrument panel, enabling the driver to adjust transmission shifts, shock absorbers and the Vehicle Dynamic Control (VDC-R) among three settings – Normal, Special or “R,” for ultimate handling. An 11-speaker Bose® sound system with speakers mounted in rigid aluminum die cast panels, which provides sound quality suitable for a supercar, is standard. Additional standard equipment for 2013 includes a RearView Monitor, Nissan Navigation System with XM NavTraffic® with Real-Time Traffic Information and NavWeather™ capabilities (XM® subscription required, sold separately), and Bluetooth® Hands-free Phone System. Nissan Motor Co., Ltd., Japan's second largest Japanese automotive company by volume, is headquartered in Yokohama, Japan and is an integral pillar of the Renault-Nissan Alliance. Operating with more than 150,000 employees globally, Nissan provided customers with more than 4 million vehicles in 2010. With a strong commitment to developing exciting and innovative products for all, Nissan delivers a comprehensive range of fuel-efficient and low-emissions vehicles under the Nissan and Infiniti brands. A pioneer in zero emission mobility, Nissan made history with the introduction of the Nissan LEAF, the first affordable, mass-market, pure-electric vehicle and winner of numerous international accolades including the prestigious 2011 European Car of the Year award. For more information on our products, services and commitment to Sustainable Mobility, visit our website at http://www.nissan-global.com/EN/. looks like nissan is looking to remove any realer added mark up and line there pockets instead!